This article was featured in the April 2018 issue of Charisma. Imagine forgetting everything you know about Christianity. Forget every rousing theological debate, every tear-stained worship session and every intercessory breakthrough. Forget everything except the Bible. If all you had was the Bible, what would it mean to serve Jesus? When Francis Chan asked that question, he left his megachurch behind. In the seven years since, he's been on a mission to follow the two greatest commandments. In Matthew 22:37-39, Jesus says, "'You shall love the Lord your God with all your heart, and with all your soul, and with all your mind.' This is the first and great commandment. And the second is like it: 'You shall love your neighbor as yourself.'" Chan accepted the challenge. On his journey, he's seen the Holy Spirit's power manifest in his life. He's felt his heart swell for God and His people like never before. And he'll animatedly tell anyone who will listen about this unfathomable—one might even say "crazy"—love that's transforming his church and community. But his path hasn't looked like most pastors'. In 2010, Chan resigned from Cornerstone Community Church, a thriving congregation of 4,000 in Simi Valley, California. Though there were many reasons for the resignation, he says one factor was the heightened scrutiny he experienced. "It was such a unique time, really, in history—when social media and everything came on the scene," Chan says. "Suddenly, people could flatter or criticize you from all around the world at any minute, and say some really cruel or very flattering things." Flattery became pride, Chan says, and criticism curdled into anger and hurt. He'd always preached with a simple goal—God, what do You want me to say?—but the scrutiny got to him. The still, small voice was drowned under the flood of feedback from fans and critics alike. "It started to mess with my mind," he admits. "I started to wonder how many articles would be written if I said this, or how many people were going to email or post things if I said that. I started caring too much about people's responses." The pressure weighed on Chan's soul. He knew he needed to get away. So he did. He resigned from Cornerstone, sold his house and moved to Asia. While there, he learned a powerful lesson from China's underground church movement. The attention-phobic humility of the Chinese church stood in stark contrast to the United States' megachurches and celebrity pastors. Chan recalls one of the Chinese believers telling him: "The most influential people in the underground church are the most hidden. No one can know who they are." Chan was struck by the beauty of that model—and personally convicted. "In America, you feel like you need to become famous in order to have an impact," he says. "But in China, it was quite the opposite. There'd better not be anyone who knows you, or you'll be in trouble. It was so cool. The Lord doesn't need our popularity or platform." As he returned home months later, Chan reflected on what it meant to truly live in ministry. Forget the book deals. Forget the headlines. Forget everything he knew about church. If he were to start all over again—with only the Scriptures as His guide—what would he do? He concluded, "You know, I think I would just walk around the streets and meet people and pray and beg God to bring disciples to me the way Jesus did." Chan believes the church suffers from a love problem. If the first step of faith is to love God with all your heart, mind and strength, most believers fall flat on their face from the starting blocks. Chan says that's obvious by how little Christians long for Christ's return. "I think that is an indication of our affection and our love for Him," Chan says. "If I'm on a trip and my kids don't really care if I come back or not, that's pretty telling. If I walk in the door after a long trip and they're looking at their iPads and ignoring me, that's pretty telling. We have these buildings filled with people, yet you'd be hard-pressed to find anyone that week going, 'Oh, I just want more of Him. I wish You were here. I can't wait till You return.' ... It has to grieve the Holy Spirit." So Chan started with himself. He set his mind on drawing closer to God, growing in love. But this didn't happen overnight. Some people naturally feel an abundance of love. For the rest of us, Chan says, developing those feelings takes intentional work. But love is not just a feeling. One way he did this was by practicing self-control and sober-mindedness in small things, like avoiding junk food or Netflix binges. Self-control produces a strong prayer life, prayer produces an intimate relationship with God, and intimacy produces love for God. Lord, I want You, Chan prayed. I know You're more important than anything, so let me exercise some self-control and discipline so I can have a sober mind in this for my prayers. Another way he develops love for God is by hanging out with people who love Him even more. "I fellowship with brothers and sisters who really love being with the Lord," Chan says. "I'm really just very encouraged by the body and people who spend more time with the Lord than I do, who have a deeper walk with Him than I do. I'm blessed that I get to fellowship with people like that, because the iron sharpens iron." As a result, Chan says his love for God has grown beyond words. He describes this growth as the biggest change in himself over the last five years: that his heart is bursting with love for God. He says the only comparable feeling is his love for his children. "Sometimes when they're toddlers or really young, I have so much affection for them, and I just want to squeeze them so hard because I don't know what else to do," Chan says. "I can't say 'I love you' strong enough. ... That's the feeling I have with God lately: God, this praying isn't enough. I need more. I don't even know how to express this. Holy Spirit, groan for me. Give me words. This isn't enough." Spiritual fruit acts as proof of this raw desire. Chan says God blesses those who love and pursue Him with everything they have—and a lack of fruit speaks to a lack of pursuit. "Scripture is always, from Day One, about being in the garden with God and dwelling with God," he says. "It's about people like David, who would be in a dry and weary land where there was no water and they'd thirst for God. It's about this obsession. It's only when you love Him with all your heart and soul and mind and strength that you really receive the fullness of the blessing of effectiveness." Francis Chan: Are You Destroying the Church? Chan's love and fruitfulness are plain to IHOPKC founder Mike Bickle. At Onething 2015, Bickle embraced Chan onstage and later invited him to speak again in 2017. "Francis Chan inspires me in his hunger to walk out the two greatest commandments—to love Jesus and people," Bickle says. "He does this in practical ways, including the way he carries himself with a servant spirit, the way he honors others more than himself and the time he invests in being a peacemaker. ... I see much evidence of the Holy Spirit working in and through him." Spirit-driven love doesn't stop with the believer. It's contagious, an insuppressible force that spreads and transforms a community. As Chan's love for God grew, he began noticing the same behavior in his family and his church. "I see fruit in my disciples, the guys I'm closest to," Chan says. "I see them hungering for Jesus. I see them seeking the power of the Holy Spirit. That's the fruit: when people take ownership of it themselves, of their own relationship with God. You don't feel like you're prodding, poking, pushing, forcing people to do what they don't really feel like doing. Now it's like people are running alongside me and setting the pace. "I see the fruit in my own wife, her longing for Jesus. I don't want to say that because I did this, this is the result. I'm just saying that those around me seem to have a deeper love for Jesus and believe Scriptures." Love for God and people permeates Chan's newest ministry, We Are Church—a series of house churches based in San Francisco. He says he intentionally began with the two greatest commandments because, traditionally, that's not where most churches start. Leaders are easily distracted by other priorities. He knows from experience. "When I started Cornerstone Church, I thought, OK, I want to preach the truth to as many people as possible," Chan says. "I just want to worship deeply. ... I thought, What is the type of church that I would want to go to?" He sighs. "Looking back, I almost think, That was kind of a dumb question: 'What does Francis Chan want out of a church?' Who cares? Why was I not desperately seeking Scripture? If God had it His way, how would the church look? I never really did that." As a result, his new churches look more like the early church than Cornerstone. Every church meets in a home and has two pastors—both unpaid. All tithes and offerings are set aside for local and international missions. When a church grows large enough, it multiplies—splitting into two groups, each led by one of the pastors. These tight-knit groups encourage members to treat others like true family, abounding in love and service. All of the churches are linked under the We Are Church umbrella. As Chan invests in these churches, he finds his heart naturally stirred toward loving others. For the first time in his life, he marvels, he's experiencing the love of God through relationship with others. "It used to be that when I was alone, in my prayer room, I would feel these intense feelings for God and really love being in His presence and really sense His presence with me," he says. "And then when I'd go to a prayer meeting, I feel maybe a fourth of that, if that. It just felt like He was more distant. But lately, as I've been praying with these brothers and sisters in the church that I love so much, I feel like I'm even closer to Him in the group. I've never felt that—being with like-minded men and women who are really, really desperately seeking the presence of God, just wanting to come and adore Him." Chan doesn't think the standard church model is wrong. But he does think it's often distracted from what matters. He compares it to throwing a birthday party for his son. He could invite a few friends over to celebrate his son and give him gifts. He could also rent out Chuck E. Cheese's and give everyone all the tokens they could want. Undoubtedly more kids would come to the second party. But it's no longer a celebration of his son: "At some point, all the other stuff distracts us from quality interaction with the person himself." "I just think we need to have a return to people who love getting together to break a piece of bread and stare at the mystery of Communion," he says. "People should love being alone with the Word of God and nothing else—just them, the Holy Spirit and the Word of God. I love to get together with brothers and sisters who thrill at the chance to move the hand of God through prayer." Because of that, Chan is vigilant never to lose focus on what matters most. He and the church's elders continually evaluate the ministry's direction with a sobering question ripped from the pages of Revelation. "It's like Revelation 2 and 3," Chan says, asking the Lord two questions. "If You looked at our church here and now in San Francisco, what letter would You write to it? What would be the main things that are glaring? Because I want to please You." He's got a few ideas. He craves an even deeper relationship with God. He wants the church to keep growing. And he confides that he'd love to see more conversions and miracles in his community. But he realizes, more than his own ideas, he needs to know God's will. That's the only way to see the impossible done in San Francisco and beyond. "For too many years I've trusted in strategy or my own intelligence or my own ability to communicate," he says. "I see that the apostle Paul could have used some of those gifts and refrained from doing that, because he didn't want to empty the cross of its power (1 Cor. 2). ... He chose to come in weakness and trembling—in greater dependence on the Spirit and less on the flesh. I'm growing in that area, and I think people who have been around me have seen me on that journey." Plenty of people who have worked alongside Chan attest to this growth, including Preston Sprinkle, co-author with Chan of Erasing Hell. "Francis, of course, is an amazing speaker and gifted leader," Sprinkle says. "But having known Francis on the personal level, the most head-spinning, encouraging-yet-convicting thing about the man is his ridiculous love for Jesus. Most leaders I know look way more spiritual on stage than they do when they're off the clock. Francis is exactly who he is, whether it's on stage, off stage, in a private setting or dealing with a food server who just messed up his order. He's always pursuing Jesus as authentically and aggressively as he can." In that pursuit, Chan seems genuinely happy. He's thrilled at what He's seeing God do. He says it's like a new season and a return to form all at once: "In some ways, I feel like such a different person, and in other ways, I feel like, 'Ahhhh, I'm back to the old me.'" For a man of many words, his vision is shockingly succinct. "I love Jesus and I love the church," he says. "And I'm enjoying them both immensely." Taylor Berglund is content development editor at Charisma Media and host of several podcasts on the Charisma Podcast Network. 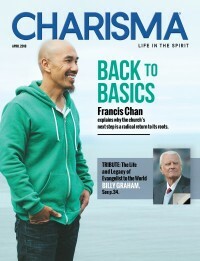 Watch pastor Francis Chan explain how he celebrates God's love for him by loving God and others at chanonlove.charismamag.com.